Moroccan Hebrew poet and translator of the thirteenth century ("Ma'arabi," "Maghrabi" = "the western" or "the Moroccan"). His poems are found only in Moroccan collections. Two of them, of a liturgic character, were published by L. Dukes in "Zur Kentniss der Hebräischen Poesie" (pp. 162-163), and they were translated into German by M. Sachs in "Die Religiöse Poesie" (p. 131). 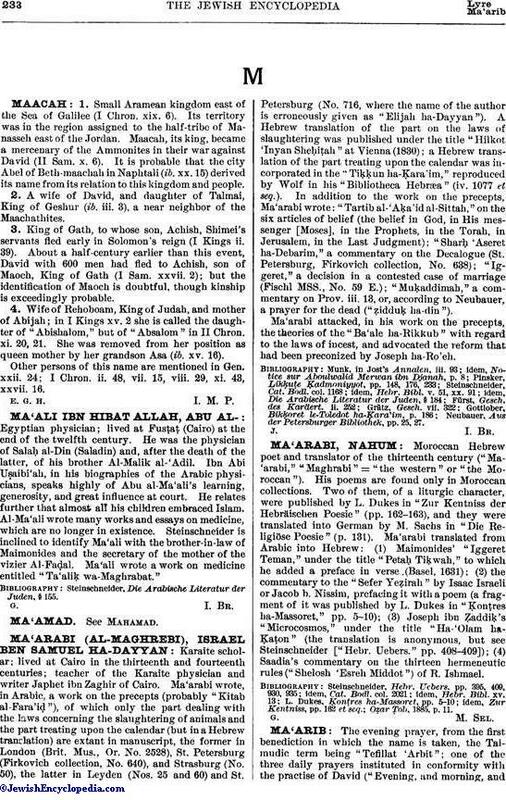 Ma'arabi translated from Arabic into Hebrew: (1) Maimonides' "Iggeret Teman," under the title "Petaḥ Tiḳwah," to which he added a preface in verse (Basel, 1631); (2) the commentary to the "Sefer Yeẓirah" by Isaac Israeli or Jacob b. Nissim, prefacing it with a poem (a fragment of it was published by L. Dukes in "Ḳonṭres ha-Massoret," pp. 5-10); (3) Joseph ibn Ẓaddiḳ's "Microcosmos," under the title "Ha-'Olam haḲaṭon" (the translation is anonymous, but see Steinschneider ["Hebr. Uebers." pp. 408-409]); (4) Saadia's commentary on the thirteen hermeneutic rules ("Shelosh 'Esreh Middot") of R. Ishmael. Oẓar Ṭob, 1885, p. 11.